Sublimely linking traditional and modern design aesthetics, and part of the exclusive Wyndham Collection Designer Series by Christopher Grubb, the Acclaim Vanity is at home in almost every bathroom decor. This solid oak vanity blends the simple lines of traditional design with modern elements like vessel sinks and brushed chrome hardware, resulting in a timeless piece of bathroom furniture. The Acclaim is available with a White Carrera or Ivory marble counter, porcelain vessel sinks, and matching mirrors. Featuring soft-close door hinges and drawer glides, you'll never hear a noisy door again. Meticulous attention to detail on this beautiful vanity is second to none and is sure to be envy of your friends and neighbors. Constructed of environmentally friendly, zero emissions solid Oak hardwood, engineered to prevent warping and last a lifetime. 12-stage wood preparation, sanding, painting and finishing process. Highly water-resistant low V.O.C. sealed finish. Cutting edge, unique styling by Interior Designer Christopher Grubb. Practical Floor-Standing Design. Minimal assembly required. Deep Doweled Drawers. Fully-extending under-mount soft-close drawer slides. Concealed soft-close door hinges. Ivory Marble Countertop. Counters include 3" backsplash. Includes Black Granite Sinks. Pre-drilled for a single hole faucet. Faucet not included. Matching mirror available. Metal exterior hardware with brushed chrome finish. Four (4) functional doors. Six (6) functional drawers. Plenty of storage space. Includes drain assemblies and P-traps for easy assembly. Variations in the shading and grain of our natural stone products enhance the individuality of your vanity and ensure that it will be truly unique. 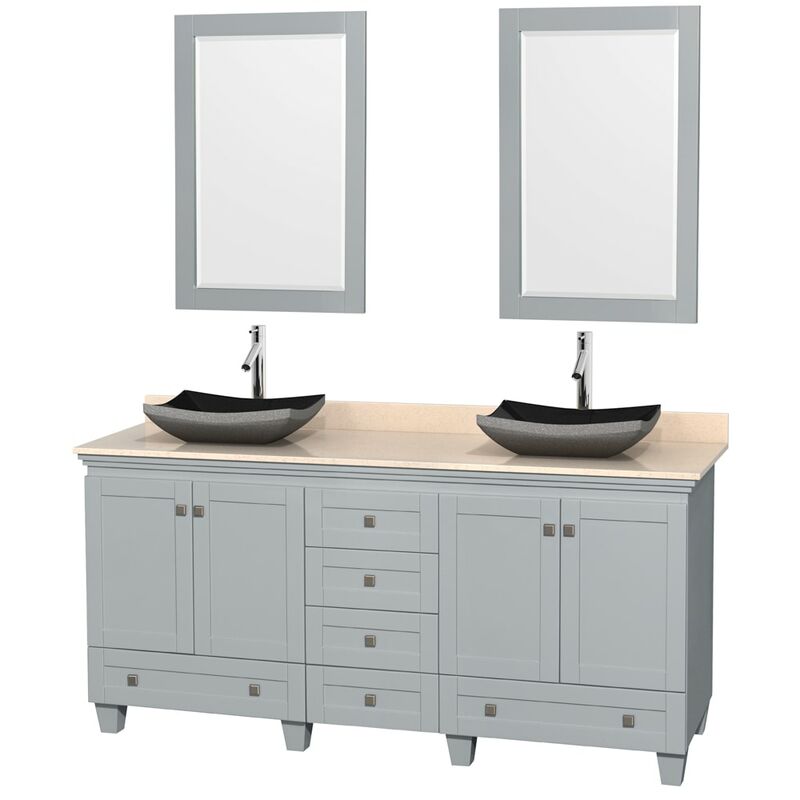 Dimensions - Vanity: 72" x 22" x 34"; Mirror: 24" x 0.75" x 36"